Psaltoda aurora Distant, 1881, is found in Northeastern Queensland Australia and is commonly known as the Red Roarer. Characters. — Head including eyes a little wider than anterior margin of pronotum, more than half as long as space between eyes and about as long as pronotum, ocelli on middle of vertex and much farther apart from eyes than from each other, face longer than broad, strongly globose; pronotum shorter than mesonotum including the cruciform elevation, the lateral margins not convexly ampliated but considerably narrowed anteriorly; mesonotum with its base narrower than head including eyes; abdomen considerably longer than broad, beneath more or less obliquely depressed from base to apex;opercula short, not or scarcely passing base of abdomen ; tympana covered; tegmina about three times as long as broad, basal cell longer than broad, apical areas eight ; wings more than half the length of tegmina, apical areas six. Location information and common name provided by M.S. 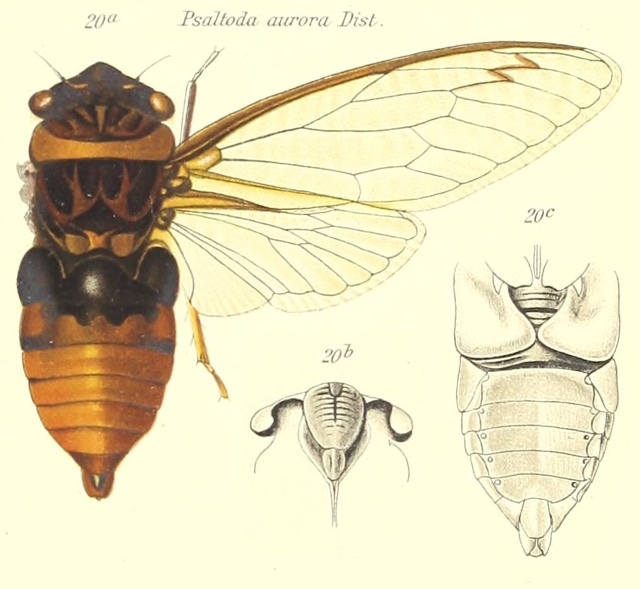 Moulds’ Australian Cicadas book. 1990. New South Wales University Press.